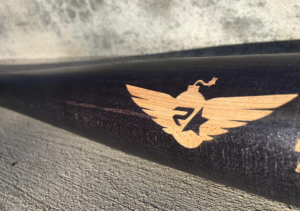 Rude American Bats, more known for their speed and powered single piece aluminum bats in the BBCOR and USSSA space, have now produced a wood Hard Maple MOAB. These are clean looking bats with a great wood premium wood feel. Those in the market for a top shelf wood bat could put these on their short list. Granted, hard maple billet wood bats are not uncommon. A number of companies produce legit sticks for all levels of play. The Hard Maple MOAB should be considered among them. After much hitting we wrie this Hard Maple MOAB Review. The Hard Maple MOAB comes in a speed and powered version. This principle, designed with the same idea as their aluminum BBCOR and USSSA bats, produces a bat for a hitter that likes a lighter feel and a hitter that likes a heavier feel. The difference in swing weight is controlled by the speed at which the barrel tapers. A faster taper tends to produce heavier bat while a slower taper produces a lighter swinging bat. As such, expect a slightly bigger barrel profile in the Power MOAB than the Speed MOAB. We measured the swing weight between the two bats and found the speed about 10% lighter in swing weight. The knob on the Speed version of the MOAB Hard Maple is tapered while the knob on the Power is more traditional. We tend to like tappered knobs more than more traditional ones but admit, clearly, this is a preference. Every since Barry Bonds and Sam Bat Maple bats have been the choice of most serious wood bat players. The tight grain structure gives a certain amount of durability and stiffness not found in Birch or Ash competitors. Although a little rougher on the hands, most Maple bat lovers appreciate the pure power transfer to the ball and the expanded sweet spot even if they tend to swing a bit heavier. You have no shortage of maple bats to choose from. In fact, every serious wood bat manufacturer in the space delivers a legitimate maple wood bat that costs over $100. Rude American adds to that pile for sure. But, we love the simplicity of their offering and the straight forward intent of their Speed and Power MOAB hard maple bats.